At age 4, Gordon Bird started singing traditional Indian Music while living on the Ft. Berthold Indian Reservation in North Dakota. By the 8th grade he was living in Pierre and had learned to play the guitar. During his sophomore year at the Flandreau Indian School. Gordon formed a band called the Echoes and later the Gordon Bird Band. In 1963 he attended General Beadle College (modern day Dakota State University) in Madison and met Mike Hinde. It was there that the Tempos and later the Chevelles were born. These were very good bands and consisted of Jerry Kroon (2010 HOF Inductee) on drums, Mike Hinde playing bass, Jim Lowe rhythm guitar, Gordon Bird lead guitar and vocals, and Gary Schultz, who replaced Kroon, on drums. The next year Rick Gillis, Bob Ayres, and Randy Pooley became valuable additions to the group. The name was changed to Gordon Bird and the Sting Rays. In not time the band achieved enormous area. They played all the top clubs and ballrooms, including the Arkota, Lake Madison Ballroom, Ruskin Park, Spearfish Pavilion, Blue Moon, and many more. They performed at homecomings and events for high schools as well as colleges with Hinde doing the booking. The Sting Rays were the first band to play at an O'Gorman Prom in Sioux Falls. One of the groups more interesting experiences happened when they were traveling to the Casino Ballroom in Kimball to play a gig. The wind blew the top of their trailer off and they lost their drum set. Fortunately a traveler spotted the drums along the side of the road and delivered them into town. Gordon Bird and Bo Ayres eventually left the band and the remaining members renamed themselves The Original Sting Rays. After the renaming, Ron Butler (SDRRMA Hall of Fame in 2011- Steve Ellis and the Starfires), Bob Shaw (SDRRMA Hall of Fame in 2012- Jay Bee and the Kats) and Mark Baumgardner (SDRRMA Hal of Fame in 2011- The Torres) joined the group. 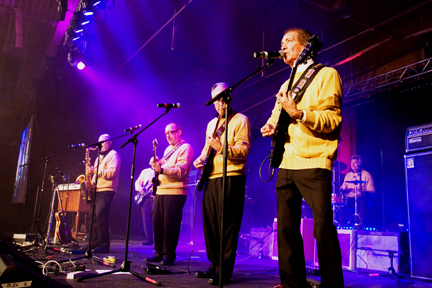 The group went on to play with many national acts including the Beach Boys, in their first South Dakota appearance, Jay and the Americans and The Hullaballos. They retained their popularity and continued to perform before large crowds. Bird went on to play with several bands in the Twin Cities area including Ernie Story and the Imaginations and Gordon Bird and Sound Creation as well as some groups in South Dakota. He also performed with family members and they appeared on a live TV show in Germany viewed by millions of people. His Featherstone Productions has made over 50 recordings. Many members of the Sting Rays are still active in music today. Rick Gillis was inducted into the SDRRMA Hall of Fame in 2011 as a member of the Torres. There were many talented musicians in the Sting Rays and they definitely left their mark in our state's musical history.